It’s official – I am an author! For those of you who have been wondering where Gabe has been on ruinism… well I’ve been using all my words for this new book on Night Photography! I should be getting my copy any day now and it will be in stock at all the major bookstores by the end of November. I’m planning a couple book signing and gallery parties with co-author Tim Cooper in NYC at the beginning of December, so stay tuned! I will say, the writing was tough going, I have a new-found respect for educators who are able to eloquently put their thoughts down on paper. Translating Gabe to English can be a challenge, but Pearson Press did an amazing job and the layout is simply fantastic. It is chock full of inspirational images, as well as plenty of tips for people interested in improving their pictures once the sun goes down. 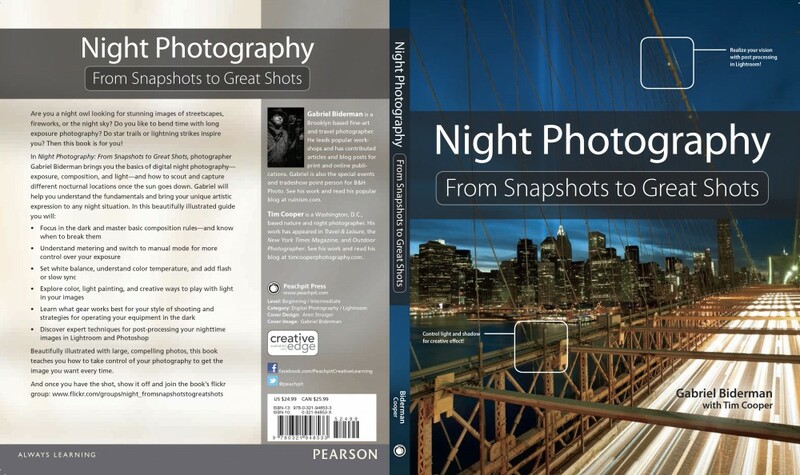 There are so many who helped with this book – from friends on night shoots, to students at workshops, and all the family and peers who have inspired and supported my late night habits over the years! I want to thank Tim Cooper, who without his help, I’d still be in the writing phase! Tim is my co-teacher on RMSP’s Dusk to Dawn- Vegas to Zion workshop and he took over two chapters – one on composition and the other on processing your night images. And then of course, my wife Nancy, who wanted to see this done (and have her husband back!) more than anyone. She really supported me throughout the process and I owe her many movie nights and hugs! Thanks everyone – looks like it is now in stock and shipping – Carpe Noctem! This looks great! When will be it be released? Congrats Gabe what an achievement! Happy Nancy too.